The geese seem to be in their winter home—wherever that is. I just noticed earlier this week that they weren’t flying over our home. For a while, flocks of them flew over heading south. Once in a while a flock headed north. For all I know they might have been the same geese. Or maybe they were part of a tribe that came back to help any stragglers. There is, after all, strength in numbers. I wondered what happened to the Goose Family of Third Avenue—the one whose adults acted as crossing guards as the little ones and mothers crossed the road, stopping traffic in both directions. The guards would stretch their necks and, with laser-like focus, aim their eyes at the cars, giving them no option but to stop so that their goslings could safely make it to the other side. Perhaps, they did know there were sentient occupants in the cars and their eyes were seeking ours, trusting that we would see in them what we have in us—a love for our children. My relationship with the Goose Family of Third Avenue covered a period of weeks, at the most a couple or few months. I can’t say for sure. 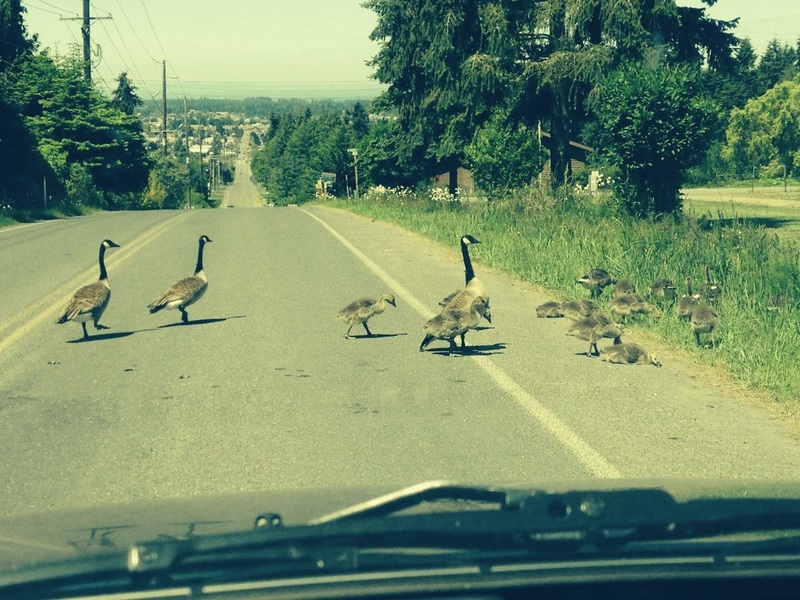 I watched their children grow from fuzzy little goslings to feathered young geese crossing Third Avenue in Sequim. At some point, I noticed that I didn’t see them anymore. I suspect the young ones were ready to fly and so didn’t have to waddle across the road. I suspect they were among the flock that flew back and forth over our property on their way south, and perhaps returning north to be part of the gatherers—those who made sure that any stragglers followed them to the home they make when winter sets in here. I know nothing about the behavior of geese. I’m just guessing. I do know for certain that those adult geese who crossed Third Avenue were protecting their young. Take a leap with me now. A couple of weeks ago I was in Seattle, staying with my nine-year old triplet grandsons while their mother was on a business trip. After dropping them off at school the first morning, I stepped into a Starbucks, intending to spend some time writing. I noticed the accent of the man next to me when he responded to my question about logging on to the café’s Wi-Fi. A few minutes later, overcoming whatever shyness I do have, I asked him about his accent—where is it from? He was from Palestine it turns out. I have met Palestinians before as I traveled, but none were as gregarious as he. Others had always been friendly, but carried a profound sadness—the sadness that comes from dislocation. My new friend was loquacious, as well as gregarious. Clearly, a born storyteller. He had attended a Catholic college in Oklahoma. Think about that—a Muslim attending a Catholic college in Oklahoma. Kind of spun my head around. Many in his family still lived in Palestine, fortunate enough to be on the lower cusp of middle class as opposed to the grinding poverty most Palestinians live in. When he asked what he could send them, the women said flowers. In addition to being an engineer, he was a master gardener. He sent them bulbs, disguising the contents’ package with lots of chocolate bars. He had to do that to get past Israeli customs, one of the signs that Palestinians are colonial subjects of Israel. The bulbs he said were lilies. “Consider the lilies how they grow: they toil not, they spin not; and yet I say unto you, that Solomon in all his glory was not arrayed like one of these. That’s what flashed across my mind—the poetry that originated in this land made deadly with sibling rivalry for their God’s love. As if God’s love is finite so he or she has to choose one flock of humans over another. I could see the women—his relatives—in a field surrounded by lilies, chattering about their daily lives, savoring chocolate bars. Such a different image when I think of the Gaza strip. A rainbow replacing the cloud of destruction I usually see in my mind. As my Starbucks’ friend led me further down the path his story took us, I learned that he was on a break from work. He had gone to a meeting where he brought flowers and chocolates to one of the women consultants, and was accused of sexual harassment. He wasn’t worried, he said, because he knew who he was. He suspected that it wasn’t the woman who complained but rather her boss, who seemed to have a thing for her. My guess is his suspicions were right. My new friend was cheerfully married with five children. He was a master gardener who knew the mystical allure of chocolate. He was simply introducing the beauty of this moment into a mundane situation. And for reasons that are beyond my comprehension, someone in authority saw fit to turn it into an us-or-them conflict. He saw the look in the eyes of the goose and forged ahead, without regard to the life he might destroy, because the goose family was in his way and he was in a hurry. And yet, I left Starbucks encouraged, rather than discouraged. I knew that my new friend would be okay regardless of the outcome of his suspension. I knew that he would be okay because, as he said, he knew who he was. And I knew that he would never plow down the Goose Family of Third Street regardless of how much he was in a hurry, for he knew that this moment of beauty could always be found in the mundane. I call it the grace of everyday living. And that, I believe, is our salvation—taking time to savor the grace of everyday living. I miss the call of the geese. Other sounds fill the air, but I do miss their call. I wonder when I will hear them again. No doubt it will be a sign that spring is awakening. And maybe there will be a new generation of The Geese of Third Avenue who will stop traffic as they shepherd their flock from one side of the road to the other. I imagine there are many reasons that the goose crosses the road. One, I am certain, is to remind us to meet its eyes so we can experience the beauty in this mundane moment. So we can savor the grace of everyday living. So we can feel loved, knowing there is enough love to go around. This entry was posted in Writing and tagged Geese migrating, grace of everyday living, Lilies of the field, Palestine, why the goose crosses the road. Bookmark the permalink.